10, August 2016: Airwheel E3, one of new products has attracted lots of people’s attention, which indicates Airwheel is going to create a new series. Currently, Airwheel fans can get to know such an Airwheel E3 through new product announcement and official website. 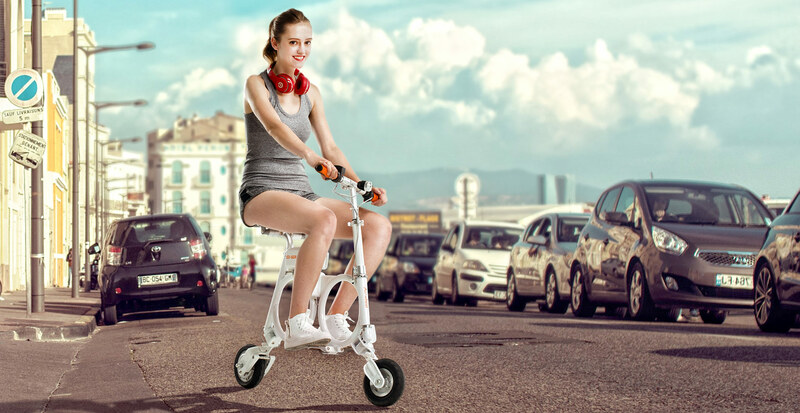 One of new products is Airwheel E3 backpack electric bicycle that has attracted lots of people’s attention, which indicates Airwheel is going to create a new series. Currently, Airwheel fans can get to know such an Airwheel E3 through new product announcement and official website. From the aspect of externality, Airwheel E3 is obviously different from other electric scooters because of the double O shaped design, which will usher a new era of electric bikes. It adheres strictly to the spirit of innovation and greenness. E3, made of aluminum alloy, is light, Easy to fold, handy and convenient. The folding size is 474*399*374mm, as small as a backpack. 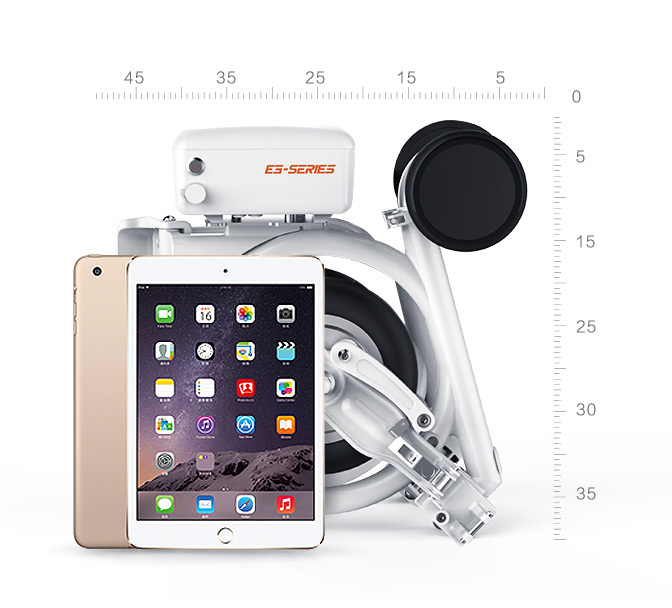 With 12.5kg item weight, Airwheel E3 can be stored in the office, car trunk and home easily. Airwheel E3 folding electric bicycle selects a ventilated rubber saddle in innovative left-right design. Whatever your body shape is, it guarantees balanced force on hips so as to bring a more comfortable riding experience. 300W powerful customized high performance hub motor, integrating the electrical power drive system, transmission device and the electrical braking system to the 8inch wheels, offers more powerful and stable force. Intelligent EBS braking system offers optimized power scheme, agility and stability in emergency braking after accurate calculation. The modular batter design of Airwheel E3, in combination with the humanized design of the USB port makes everything possible. You can charge your devices any time, such as USB night light, USB fan, smart phone and other daily electronics. More usages are waiting for you to discover. 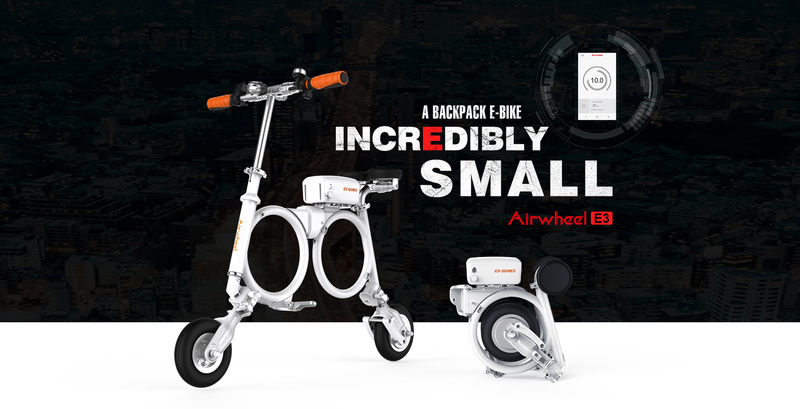 Airwheel E3 smart electric folding bike has an exclusively developed APP, which can connect Airwheel E3 with the cell phone. Then, such an APP can monitor the real-time dynamic data and riders can read them from the phone. In addition, the APP also can conduct fault detection and make sure safe riding. In the near future, Airwheel will build an intelligent ecosystem and provide more intelligent services. E3 is one of new arrivals to Airwheel this year and is reputed as the most subversive e bike.